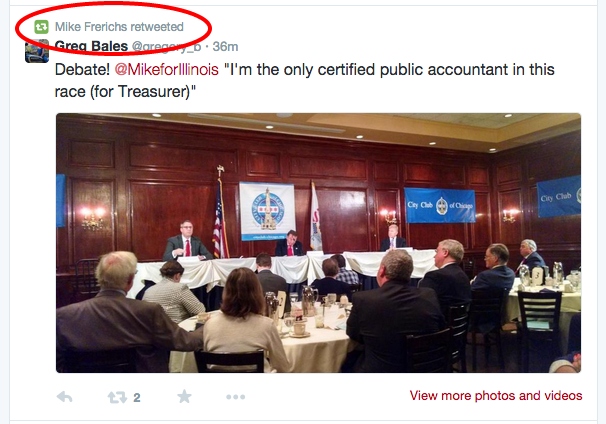 Mike Frerichs - who is running for Illinois Treasurer - is now out touting the fact that he's the "only certified public accountant in the race" for Treasurer. His official 'MikeforIllinois' Twitter handle re-tweeted this message to voters all across Illinois. Mike Frerichs is NOT a certified public accountant. Is that what he wants voters to believe? A CPA wouldn't have botched the Champaign County ERI program and cost taxpayers millions of dollars would he?